In March of 2018, the number of new drilling permits issued by the Railroad Commission of Texas (RRC) fell compared to the same period the previous year. Completions processed by the RRC rose during the same time frame, meaning oil and natural gas production continues apace, regardless of “new” projects in the field. And, as well completions rise, so does the demand for high-quality frac sand. According to the RRC, 2,712 wells have been completed in Texas from January through March of this year. 867 of those, or about 43%, occurred in March alone. By comparison, the same period in 2017 only saw 1,925 completions. The Midland district had the most completions, accounting for about half of all the completions in March. That’s no surprise as Midland represents the epicenter of the Permian Basin. The rise in completions isn’t new. Both January and February show a similar increase compared to the previous year. The number of permits issued by the RRC is also following a trend in 2018. The RRC issued 1,220 permits in March. In 2017, 1,310 original permits were issued. Maybe more relevant is the increasing number of Drilled Uncompleted (DUC) wells in the Permian. According to the EIA, the DUC count in the Permian climbed to 3,044 in March. That’s a 4 percent increase over the 2,922 in February. The number of DUC wells means producers have already-drilled assets ready and waiting to be fracked and put online to take advantage of stronger oil prices and rising demand. 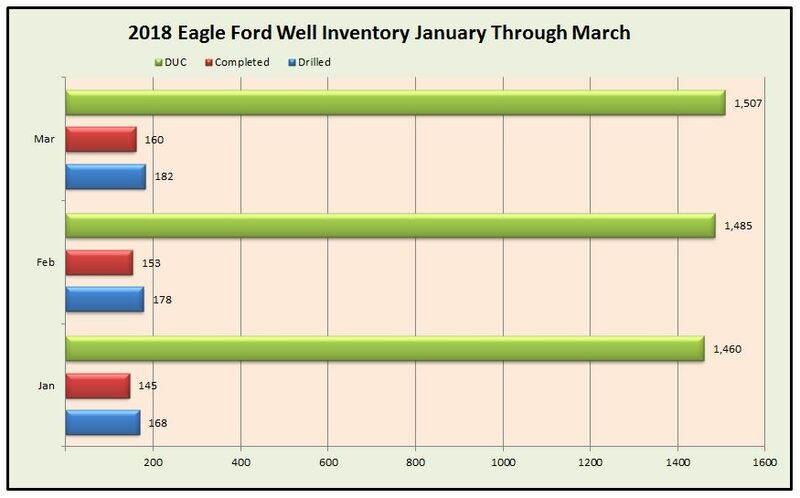 Another top producing basin in Texas, the Eagle Ford, shows similar trends of increasing completed wells in addition to rising inventory in DUCs. With increased activity comes increased demand for resources. One such resource is frac sand, a critical component of the completion process. Sand is a key component of hydraulic fracturing, or “fracking,” which has released a flood of oil and natural gas from shale deposits across the United States. With fracking, a water-based mixture of sand and chemicals is injected into a wellbore at high pressure, forcing fissures within a rock to open thus releasing the hydrocarbons held within. Approximately 9.5 percent of fracking fluid is composed of sand. How much frac sand producers use per well varies depending on factors such as the geophysical makeup of the formation being drilled, and depth. On average, horizontal shale wells in the Permian Basin require around 5-million pounds of proppant in total. Some wells require up to 5,000 pounds of frac sand per lateral foot. 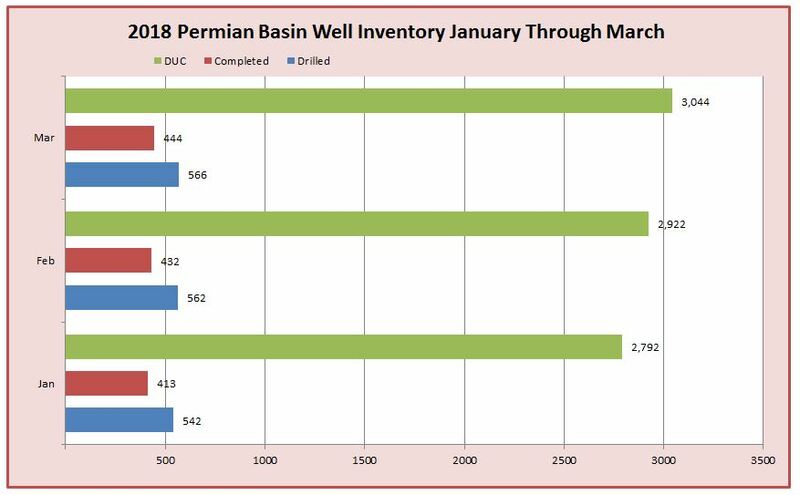 Taking into consideration just the number of DUCs in the Permian Basin and beyond, bringing new oil to production requires a staggering amount of sand. In 2017, an estimated 50 billion pounds of frac sand was used in the Permian basin alone. Usage is expected to continue to climb, reaching nearly 120 billion pounds in just five short years. The influx of regional frac mines serving the Permian Basin has created a viable, economically-advantaged solution for operators for both new drills and DUCs. With local delivery, the industry enjoys easier logistics, reducing their supply chain from 1,200 miles to 200 or less. The shorter supply train drives down costs and headaches––considering approximately 300 truckloads of sand is needed to service a single well. While in-basin sand is relatively in its infancy in the Permian, operators should expect to see 35 million tons of in-basin sand available in the basin by summer of 2018. According to Reuters, sourcing in-basin frac sand has the potential to save oil producers between 40 to 50 percent of the cost and delivery of frac sand on a per well basis. That equates to a cost savings of roughly $500,000 per well. With the potential for cost savings of that magnitude, there is little doubt that in-basin demand will continue to grow. For more information on Black Mountain Sand’s regional frac sand capabilities, including both 100 and 40/70 mesh, contact us today.